What does the word 'cottage' mean to you? For some, the term brings to mind a vacation in a rambling home, where the family has plenty of room to spread out while enjoying some rest and relaxation. For others, it reminds them of a cozy home nestled in the woods - the kind of place where children go to visit their grandmother. No matter what you envision, Donald A. Gardner Architects can help you achieve it with our house plans. We have small cottage plans and spacious estate cottage home plans available with our signature style, so you will find exactly what you need to create your dream home. 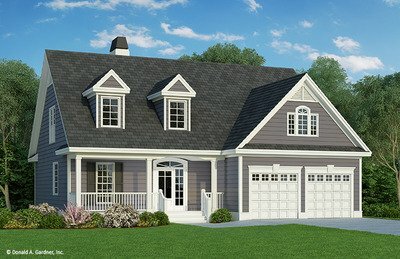 Our cottage-style house plans include a number of designs to fit most needs. These designs feature amenities and style in a smaller footprint that follows the traditional cottage-style home, yet with the modern amenities that today's homeowners want. Ideal for year-round living and vacation homes, these home plans embrace rustic living with modern features such as more open floor plans, ample storage and spa-inspired bathroom layouts. Consider the cozy Runnymeade as an example. This 1,583-square-foot cottage has an attractive European exterior and ample space inside. Cottage floor plans do not have to be small. We have larger options that embrace the rustic look without sacrificing space, including two-story plans such as the Brielle, a Craftsman with four bedrooms, four baths and more than 3,000 square feet of living space. If you believe that cottage house plans are the right choice to match your wishes, trust Donald A. Gardner Architects to help. Our award-winning team has house plans for everyone, from cozy retreats to spacious homes. Whether you are building a vacation home or a home for year-round enjoyment, our floor plans will fit your needs well. Visit our website to view our extensive selection of floor plans, then buy directly from our architects to ensure you get accurate answers to any questions you may have along the way.